LOM architecture and design, FDP’s sister company, is delighted to announce the completion and opening of a new flagship headquarters building for the National Bank of Oman. Designed and delivered by a joint venture between LOM architecture and design in London and Ibrahim Jaidah Architects and Engineers in Muscat, the new head office combines tradition and innovation to create a striking landmark which offers high quality commercial space within a unique Omani building. 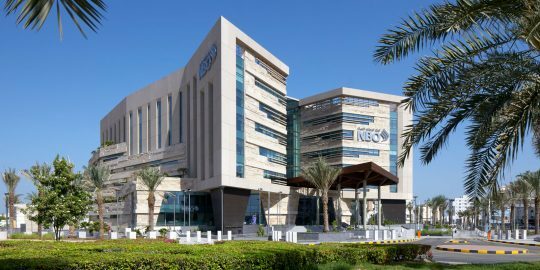 NBO’s new head office is a contemporary building inspired by Oman’s landscape, topography and traditional architecture. The building is rotated on its site in order to face the Grand Mosque and mountains, creating an accessible pedestrian plaza as a new public space for staff, visitors and the community. The central atrium – inspired by the form of Oman’s wadi gorges – delivers a series of dramatic internal spaces which balance public access with security requirements to create a semi-public event space. Integrating native planting into the façade and public realm means that the building will evolve over time and become part of the future landscape of Muscat as the city develops.